Demetri matured enough to know he needed a bigger body to prosper in a big world. See how his time, energy, and study to bodybuilding earned him what he wanted! Growing up, I had always been naturally lean/lanky, and as cliché as this story goes, I honestly did hate it. Before my senior year in high school, I weighed in at 138 pounds. I was sick of people dismissing me because of my size, and I didn't want to finish senior year in the light I currently lived in … This was something I owed to myself. The problem was that there was so much information to take in, and I didn't have any idea where to start. 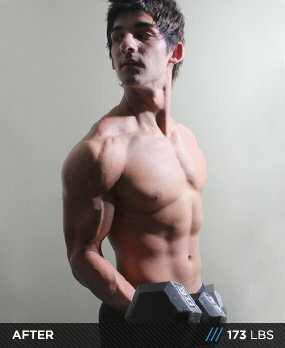 By carefully researching the many fitness articles/forums on Bodybuilding.com, I got all the information I was looking for. I learned about the different types of workout splits, the importance of dieting, and any other informative tools to get started. Determination is all you need. Demand yourself to do it and you will. 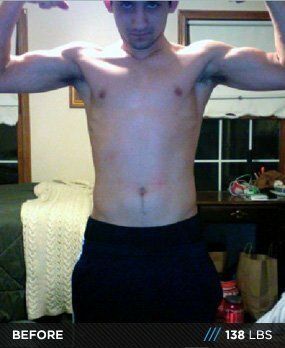 At the beginning of my journey, I didn't have access to a gym aside from my high school gym, and started working out at home on a cable Bowflex. But as time went on I realized in order to get the gains I was looking to achieve, I had to incorporate REAL weights. Once I did, all of this transformed into a passion. The most important thing I found that worked for me was making sure my body and my mind were always in sync. Aside from obvious muscle fatigue, your mind is what ultimately keeps your body persevering through whatever training obstacles you set for yourself. I'd make sure my lifts were always harmonious with my mind, and would keep this in mind for every set. This, along with consistency, is a great formula for the goals any person ultimately has in mind. Also paying more attention to my diet put on the clean weight I had been striving for. There are plenty of informative diets on Bodybuilding.com that are great for people with fast metabolisms, and dedication to these types of things will show you that your metabolism is not as fast as it thinks! Supplements are great aids in the world of bodybuilding, but are nothing more than that. I've always tried to keep in mind that food is the ultimate source to get the fuel the body needs to grow, and supplements are more along the lines of tools to keep you pushing forward efficiently. I've tried a wide range of supplements in the course of my 3 years of training, and have finally settled to the three I've established work for what I'm striving to do: protein, pre-workouts, and amino acids. Protein powder (any kind) is obvious and basic in the fitness world. Great for hitting the protein deficits one sets in a day, and is a staple in all forms of growing. I take a scoop in my shaker for breakfast, then two scoops post workout. As for specific brands I switch off with BSN Syntha-6, and Cytosport Complete Whey. Regardless of the regularity of time spend in the gym, none of that means much without a sufficient diet to back it up. If you think of your body as a machine, food is the fuel that you're putting in to make it run constantly and efficiently. Due to my fast metabolism, cheat meals were acceptable 2-or-3 times per week - that being mainly fast food. As long as the general outline of your macros are hit, and you're pushing hard in the gym, cheat meals are not bad at all come bulking season. I am a big advocate for volume training if you're striving to alter your physique. Throughout the duration of my training, I've most likely been on a bodybuilding-based split for about 90% of the time, and have seen steady clean results from it. Although your numbers won't jump as quickly as being on a strength-based split, I have also found steady increases in certain major lifts if you keep a meticulous attitude about improving form/weight every time. As of late, I started incorporating abs into my routine, but due to my naturally lean physique, abs have not been a primary focus up until now. I spend about an hour and a half to two hours in the gym, and thoroughly enjoy it. I've never looked at the time spent in the gym as tedious, and it's more of a place of solace than anything else. Make sure the time you spend in the gym is enjoyable! It should never be a chore, and if it is, switch things up. All I can really say is come up with a diet that pertains to the goals you are striving for, and don't stress if your day falls short of what goals you are on occasionally. Obviously consistency bears the best rewards, but life is life, and sometimes you won't be able to hit everything in a day that you need to. Bodybuilding is something that should enjoyed, and something you do for yourself. The best thing about it is that it's the ultimate reflector, and shows you EXACTLY that what you put in - you get out. Train hard, eat right, and have fun watching the amazing things your body is capable of.